BANGI, 29 August 2010 – Universiti Kebangsaan Malaysia Deputy Vice Chancellor, Prof Dato’ Hassan Basri was quoted by two Indonesia newspapers as expressing the hope that the education sector could help ease the current strain relationship between Indonesia and Malaysia. Prof Dato’ Hassan, was in Jakarta to represent the Vice Chancellor, Prof Tan Sri Sharifah Hapsah Syed Hasan Shahabuddin at the Convocation of Universitas Indonesia. This is the first time the university invited UKM Vice Chancellor to the ceremony. While there, Prof Dato’ Hassan signed an extension of the MoU between UKM and Universitas Indonesia . 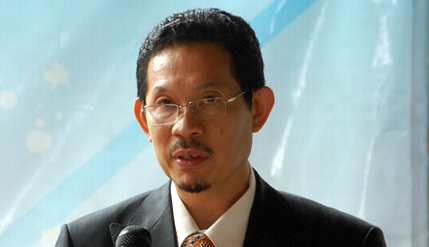 The Tempo and Republika newspapers quoted him as saying that many Indonesians studied in Malaysia. In UKM itself, there are now 600 Indonesian students studying at the master and PhD levels. He expressed the hope that the exchange programme would continue, likewise the cooperation between Indonesia and Malaysian lecturers in the field of research which would benefit both countries.